RALEIGH, N.C. — A Wake County sheriff’s deputy who jumped into the Neuse River Monday afternoon in a desperate rescue effort said the water was rough and murky when two children drowned near the Old Milburnie Dam. He said that currents were so strong underneath the surface, another officer had to push him down to get to the bottom. Police say cousins Katherine Rcom, 10, and Johnny Nay, 7, were fishing with family members at the dam when they went into what appeared to be still water, got pulled under and never resurfaced. Their bodies were found about four hours later. Kay and two Raleigh police officers were among the first to arrive on the scene. All three jumped into the water, despite the dangerous currents. Jeff Hammerstein, district chief for Wake County Emergency Medical Services, said that, when it comes to bodies of water, looks can be deceiving. 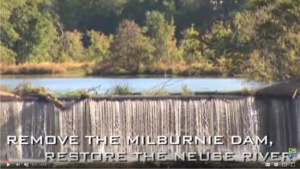 Though the water appeared still where the children went in, currents whipped up by the Old Milburnie Dam, churned by objects underneath, make the area especially unpredictable. “(The currents) can easily pull a person under and hold them under,” he said. He added that swimming in moving, unfamiliar water is never a good idea. Fishermen who frequent the river say the rushing water near the dam is too dangerous for swimmers. In July 2008, two men, John Brian Taylor, 21, and Michael Patrick McDowell, 20, also drowned while swimming in the area.